Ken is my old high school friend, college roommate and friend of the site. He lives in the DC area and begrudgingly has assimilated some Capitals knowledge and has been kind enough to share some thoughts for the upcoming season. Give him a follow on twitter from the handle above. Disappointment is a word that Washington Capitals fans have en-grained into their vocabulary as the window for a Stanley Cup Championship with Alex Ovechkin closes a little more with each springtime failure. The 2013-2014 Washington Capitals entered the Metropolitan division with high hopes for a playoff berth and another run at the Stanley Cup. Instead, the team finished 9th inthe Eastern Conference, missing the playoffs for the first time since 2007. This season, a new coach and a revamped defense has Washington once again poised for a playoff and Stanley Cup run. For the Washington Capitals, everything begins and ends with Alex Ovechkin, one of the most prolific goal scorers in the world. Last season, #8 scored a league leading 51 goals including 24 on the power play, 8 better than anyone else in the league. The 2013-2014 season was the fifth time in Ovechkin’s career that he recorded a season of 50 or more goals, and is one of only five active players to have multiple 50-goal seasons (Jaromir Jagr, Dany Heatly, Steven Stamkos, and Jarome Iginla). However, despite having a Rocket Richard winner and the league’s top power play (tied with the Pittsburgh Penguins), the Washington Capitals, as a team, finished a pedestrian 13th in the league in scoring, averaging 2.74 goals per game, down from 3.04 during the 2012-2013 season. In order to become a more consistent offensive team, the Capitals have to improve their 23rd ranked 5 on 5 scoring. The team’s 5 on 5 troubles become even more apparent when reviewing the +/- numbers of some of the top line players. Alex Ovechkin, despite all of his scoring, finished an anemic -35 on the season. Only Steve Ott and Alex Edler had worse +/- numbers for last season than Ovechkin. The +/- numbers are not just limited to Ovechkin. Marcus Johannson (-21), Nicklas Backstrom (-20), and Mike Green (-16) all recorded double digit +/- numbers for the season. The +/- numbers of this team are truly remarkable considering that Ovechkin led the league in power play goals and Nicklas Backstrom led the league in power play points with 44. Another contributing factor to these woeful +/- numbers was the 33.5 shots allowed on goal per game. 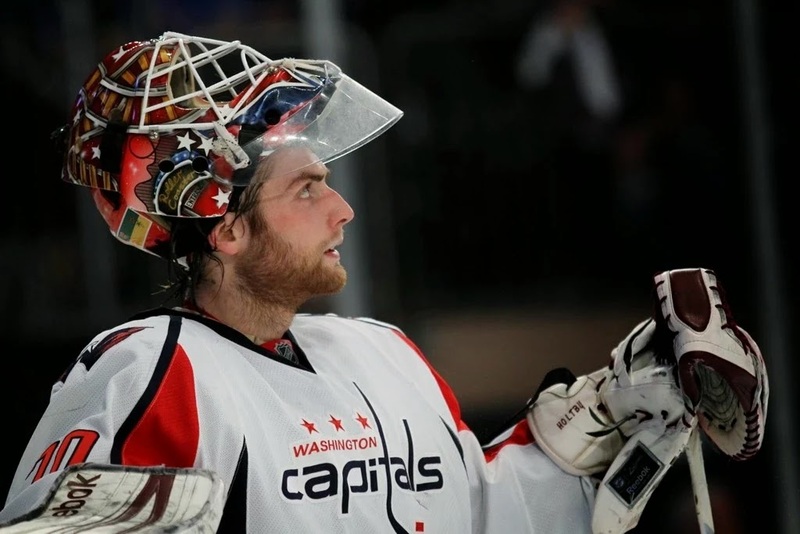 Washington’s top net-minder, Braden Holtby, in 48 games last season had a goals per average of 2.85 and a save percentage of .915. Holtby struggled at times last season with the coaching decisions of Adam Oates requiring him to play deeper in the crease and the late season acquisition of Jaroslav Halak. With Halak and Oates departed, Holtby’s career numbers indicate that he is capable of holding down the number one spot having won 60 games in 4 years of NHL service. While owning the league’s top power play unit and one of the worst 5 on 5 units in the league, the Washington Capitals made two offseason moves that they hope will help to improve both categories with the signing of ex-Pittsburgh Penguinsdefensemen Matt Niskanen and Brooks Orpik. Niskanen in particular adds a lot of value to the Capitals blue line with his ability to perform on the power play, something he did well last year for the Pittsburgh Penguins scoring 15 goals on the man advantage. Orpik, despite recording 221 hits (18th in the league) and blocking 146 shots last season, is entering his 12th NHL season, has never played a full season due to injuries, and has clearly lost a step compared to his earlier playing days. The signings of Niskanen and Orpik, the emergence of defensemen Karl Alzner and John Carlson, and the continued development of third year player, Dmitry Orlov, have created a logjam on the blue line for the Washington Capitals. This glut of defensemen may make the 28-year-old and two-time Norris trophy finalist, Mike Green, expowed more than $6 endable at this year’s trading deadline. Green, despite being million in the final year of his 3-year deal in the 2014-2015 season, should garner a lot of attention from teams that failed to sign one of this season’s top free agent defensemen. By moving Green, the Capitals could also clear up some much-needed cap space caused by the eyebrow raising contract given to Brooks Orpik (5.5 million AAV). While the Capitals were attempting to correct some issues on the blue line, signing the aging Orpik tied the front office’s hands to address a glaring need at center on the second line. 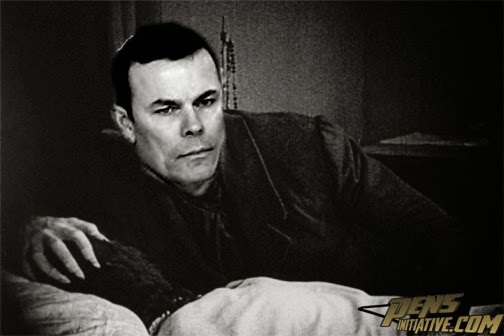 New GM Brian MacLellan failed to re-sign center Mikhail Grabovsky after disagreeing with his contract demands, therefore creating the hole on the second line. Grabovsky then signed with the New York Islanders, leaving only Brooks Laich or Marcus Johansson as options on the current roster to center the second line. If, however, this team is going to be playoff contender, then this position will need to be improved. Due to cap restrictions caused partly by the Orpik signing, the only way an improvement at second line center can occur is via trade and Mike Green could be the player who gets moved. One possibility for the Capitals to fill the void created by the departure of Mikhail Grabovski could be Evgeny Kuznetzov, the only rookie likely to make the opening day roster. The 21-year-old made his long-awaited debut last season scoring 9 points in 17 games. In the three previous seasons in the KHL,Kuznetsov scored 105 points in 131 games while also displaying a well-developed two-way game. If Kuznetsov can lock down the left wing spot on the top line with Ovechkin and Backstrom, he has the potential to score the most points for a rookie since Evgeni Malkin scored 85 in 2006-2007. 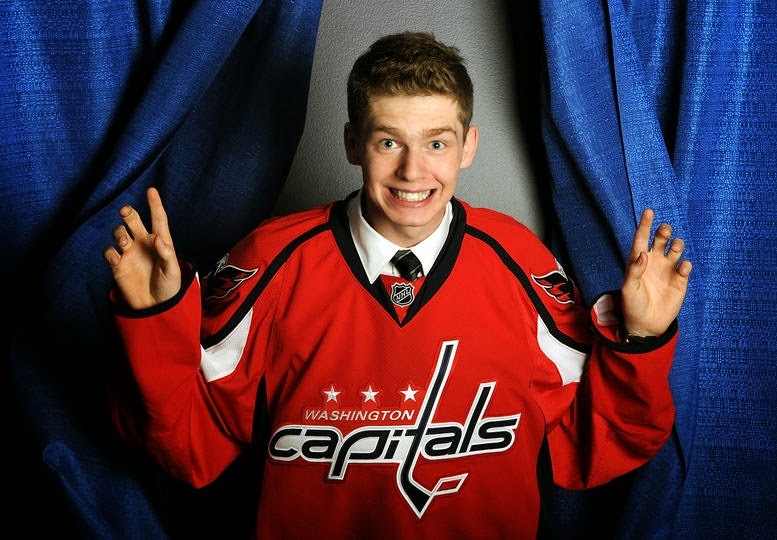 Kuznetsov should have a floor of 55-60 points and be a Calder trophy contender no matter what line he plays on. He could also be an option to center the second line if other options do not present themselves. possibly surprised or in danger? Under the direction of new head coach Barry Trotz, the Capitals are looking to be a playoff team based on Trotz’s reputation of coaching a sound defensive game while also maximizing his players’ strengths. Trotz, however, will have to find a way to get his message through to Alex Ovechkin and Nicklas Backstrom, both of whom have a history of clashing with head coaches when they do not agree with the style of play dictated by the coach. If Trotz can also further develop the secondary scoring from grinders like Troy Brouwer (25 goals last season) and Joel Ward (24 goals last season), then this team should not have to rely so heavily on the power play to score goals. With Braden Holtby poised to be the full time starter in goal, an improved defensive unit and philosophy, and if the second line center can be addressed, the Washington Capitals have the ability to realistically challenge for Metropolitan Division and Eastern Conference supremacy, finishing as high as 2nd in both.